In a perfect world, we would all set strong boundaries at work, refuse to take on more assignments than we should and leave at the end of a traditional 8 hour work day to enjoy life. Unfortunately, some of us find ourselves in a pattern of saying “yes” to every assignment available, working ridiculous hours and losing sleep worrying about all the work we need to do. Let’s face it: some of us get wrapped up in the cycle of working too much. When you’re a workaholic, the Universe initially responds to you by giving you more work in order to feed your insatiable hunger for long hours and the feeling of accomplishment and faux-joy you get when you finish an astronomical amount of work. Then, you get the added bonus of being recognized by your supervisors, co-workers and peers as a hard worker, multi-tasker and team player. And the cycle continues: too much work, adrenaline-aided completion of the work, followed by the euphoria of accomplishment and recognition. But, that cycle can only continue for so long before it starts to take its toll on you physically and emotionally. That’s when the Universe responds to your depleted energy in an attempt to save you from your workaholism. When you start crossing the line between efficiency and burnout, the Universe will often respond to your energy and create situations in your life that are meant to give you permission to rest. First, you will likely experience insomnia and fatigue. You’re staying up all night thinking about all the work you have to do and then dragging through the day because of your lack of sleep. You could have finished your work if you had gotten a good night’s sleep. But you took on more work than you could handle and now you are stuck in the 3am wake up and worry cycle. If you ignore the sleep deprivation long enough, you will likely get sick in the form of a cold or the flu. You try to force yourself to work through it, but eventually you will give up and take that dreaded sick day. At that point, you can choose to either sit at home stressing out about all the work that you could be doing or recognize the gift of sleeping that the Universe has given you. I will admit that in my line of work, I constantly go in and out of cycles of being a workaholic. There is never a shortage of work and there is always this feeling that I am the only one who can do whatever is assigned to me. In a business built on the billable hour, it’s almost impossible to say no to work. I will fight through fatigue and suffer at work through a cold or the flu. I never know which one it is because I refuse to take time off work to go to a doctor for a diagnosis. Recently, I was working on several cases, one of which required the dedication of a lot of time in order to meet a deadline. I was working 11-12 hour days, dragging myself in on weekends and was in workaholic zombie mode. One day, I took a quick break to run out and get some lunch. My office is located across the street from several food places, so I switched from my heels into my flats and power-walked across the street. I wanted takeout from a local Greek restaurant and when I got there, the line was insane. I could have left, but I decided to wait. 20 minutes later, my food was ready and I raced out of the restaurant to return to the office. As soon as I exited the restaurant, I was stuck behind what appeared to be every slow-walking person on the planet. When I finally had a chance, I quickly walked around a group of slow-walkers until my heel got stuck in a crack in the sidewalk and I literally fell out of my shoe in front of every slow-walking human in the local vicinity. As I walked with one barefoot back to the heel, I thought to myself, “How the hell do I have heels on when I put my flats on before I left? ?” It was then that I noticed, in stark horror and humiliation, that I had somehow put on one heel and one flat shoe. The group of slow walkers laughed at me as I used both hands to pull my heel out of the crack in the sidewalk and put it back on. At that point, I practically ran back to my office causing half of my Greek meal to spill out of its container and into the plastic bag that was holding it. After making it back to the safe confines of my office, my humiliation turned to amusement. As I began sharing my plight with my co-workers, I was able to laugh with them about how ridiculous it was that I had been so stressed out and so oblivious that I had left the office looking like a psycho. 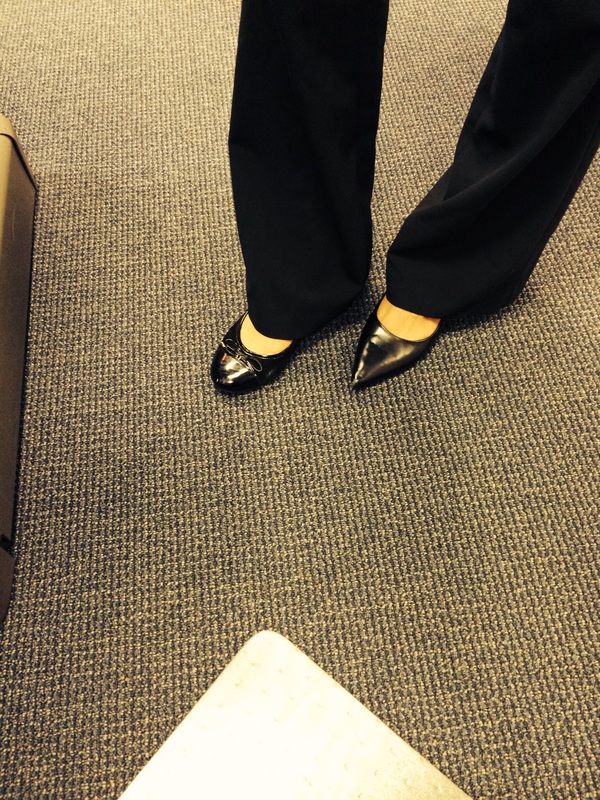 How can someone not notice that they are wearing one heel and one flat?! Picture taken by my assistant while she and I laughed and tried to figure out how I did not feel the difference between the two shoes. Until then, I had ignored all the attempts that the Universe had made to slow me down. But this had finally gotten my attention. I was so stressed out, overworked and depleted that I walked to lunch, stood in line for 20 minutes, and had not noticed my wardrobe malfunction until I literally fell out of it. Making me tired or sick had not worked. But making me laugh at myself did. After that day, I began gradually setting boundaries at work: I slowly began to back off of my unsustainable 12 hour days and weekends. Now, I can’t lie. I still work 12 hour days and weekends occasionally, but it is no longer the norm. This is admittedly difficult to do in certain professions that require long hours, especially in the practice of law. But, you will be shocked when you discover you can get more work done in less time and in a more efficient manner. Why? Because once you send a signal out to the Universe that you are taking care of yourself and making yourself a higher priority than your job, it will create more situations in which you are given permission to take more time for yourself. Have you ever ignored signs that you are working too hard? If you constantly work through fatigue and sickness and ignore the Universe’s signs to you to slow down, maybe you will attract a situation that is so silly and ridiculous that it makes you take a step back, laugh and make time for yourself.